Have you heard about or seen a German Shepherd Husky mix? I hadn’t! Not until I took a walk one day and saw the most magnificent dog walk past me. I was blown away when I heard what breed it was, and spent hours researching and learning more about them. Some would say that these wolf-like dogs are the next best thing to sharing your home with a wolf. Here are seven characteristics of the German Shepherd Husky mix that will make you love them as much as I do. #5. Playful, Energetic and Adventurous or Lazy Temperament? The German Shepherd Husky cross is a relatively new breed of dog. Experts believe that the first one was intentionally bred in the 1980s. Despite this short history, they have already become trendy and increasingly common. They take after both their parents: the Siberian Husky and the German Shepherd. These dogs are referred to as a hybrid or designer breed because both these parents are purebreds. German Shepherd Husky mix puppies can have any combination of their parent’s traits, but they often resemble one more than the other. They resemble their parents in their personality as well as their appearance. Although not everyone has heard about this breed, they have been recognized as a breed by dog organizations in the United States. These organizations are the Dog Registry of America (DRA) (1) as well as the American Canine Hybrid Club (ACHC) (2). 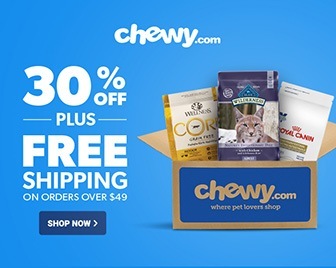 This recognition can make it easier to find reputable breeders and shows that the breed has become more accepted. A new breed needs a new name right? 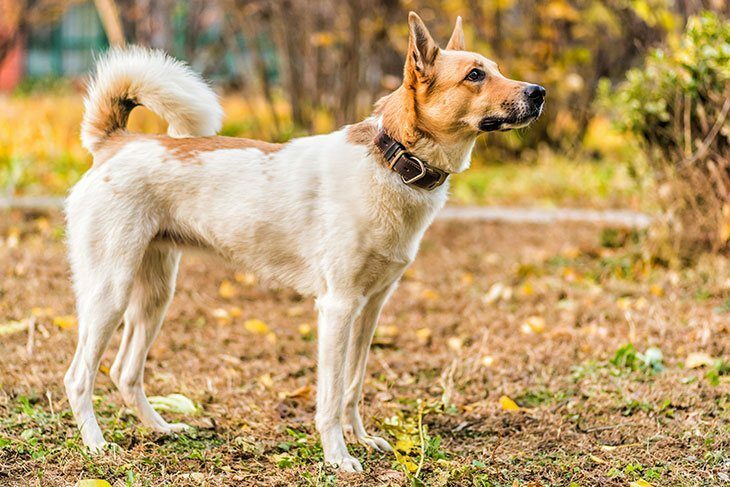 And wait for it… How does German Shepherd Husky mix sound? This is one of the many names that people use to refer to these dogs (3). So if you decide to look for your own wolf pup keep this in mind when scouring the internet for breeders. Some other names are Husky Shepherd and Siberian Shepherd among others. 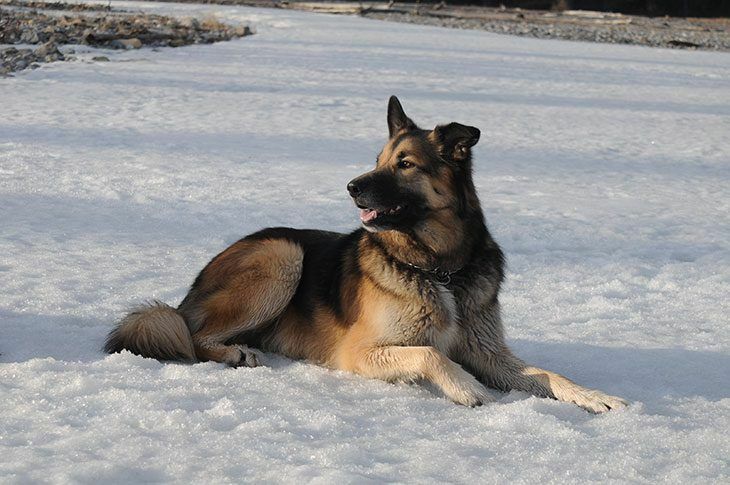 German Shepherd Husky mixes can sport a large variety of coat colors and can vary quite a lot in appearance. Some of them look exactly like German Shepherds while others would look more like Huskies. However, most of them look like a blend between the two. The most common coat colors are darker colors like black and dark brown. Depending on the parent’s fur, it could also be lighter even white. Usually, their coats are made of patches of mixed colors. One of the most striking aspects of Huskies appearance is their icy blue eyes. Equally beautiful are German Shepherds warm amber or chocolate eyes. German Shepherd Husky mixes could inherit either brown or all blue eyes from these breeds. 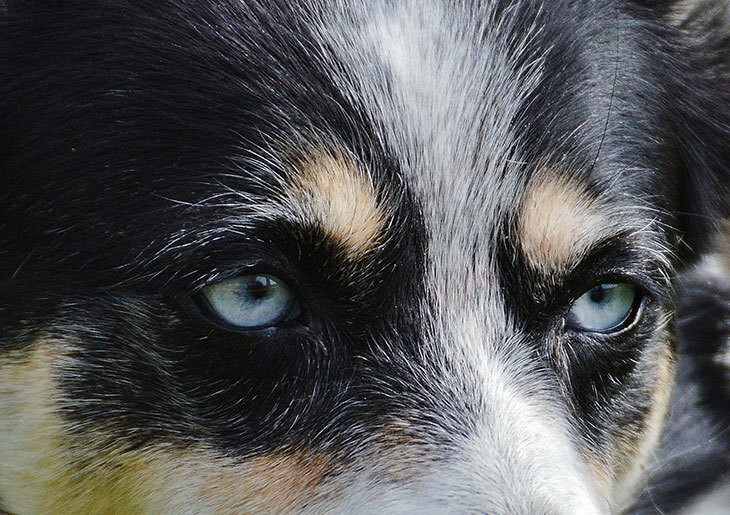 Sometimes they might be even more special and have one blue and one brown eye which is called particolored. See how amazing they look with this unique color combination. German Shepherd Husky mixes look even more wolf-like as a result of their size. Both parents are large breed dogs. Female Siberian Huskies weigh from 35 to 50 lbs, and their average height is 21 in. While male Huskies are even weightier coming in at about 45 lbs and measuring up to 23 in (4). German Shepherds are much larger with both males and females weighing between 75 to 95 lbs. Full grown males measure up to 25 in and females up to 23 in (5). Considering this, it should be no surprise that German Shepherd Husky mixes are also big and strong. Their average weight and height are 50-90 lbs and 20-24 in respectively. On average they are therefore usually a bit smaller than German Shepherds and larger than Siberian Huskies. Smart parents always have smart kids right? In the case of German Shepherd Husky mixes, this is definitely true. Both Siberian Huskies and German Shepherds are very intelligent breeds, and this transfers to their offspring (6). This means that German Shepherd Husky mixes are quick learners and are very trainable. You can train them anything from house manners to fancy tricks. However, dogs from this breed often also inherit their parent’s independent spirit and strong personality. This could become a problem if you don't train and socialize them properly. That is why they could be a challenge for inexperienced owners. Training and socialization should begin while they are still puppies and should focus on rewarding them for positive behavior. Owners should avoid using negative responses. 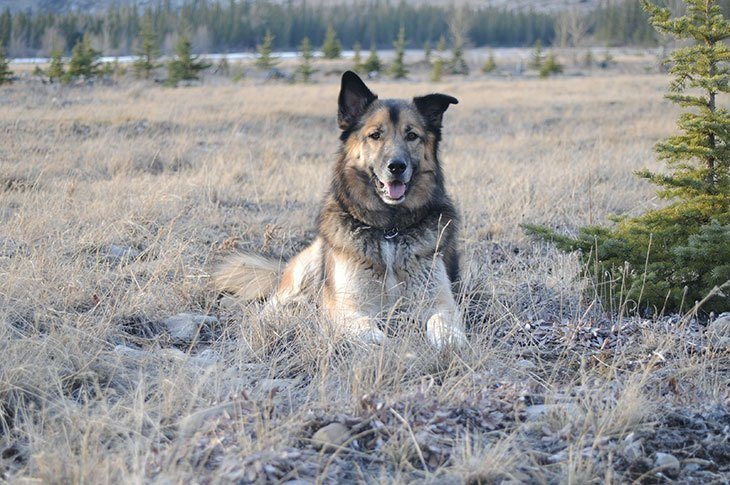 The internet is full of resources on ways to train German Shepherd Husky mixes so if you need more info give this article a look (7). One thing that German Shepherd Husky mixes have is energy! They need to be physically as well as mentally stimulated to avoid them becoming bored and possibly naughty (8). Huskies and German Shepherds are both considered to be working dogs. For example, German Shepherds are often trained by the military and the police. The German Shepherd Husky mix inherited this tendency and are also hard working. They love taking part in a variety of activities with you (9). Owners sometimes let them engage in activities like herding or fieldwork, but they can have just as much fun walking, hiking, jogging and playing. However, sometimes a German Shepherd Husky mix inherits Huskies calm and gentle demeanor. Ironically these pups could then be seen as lazy. Like its parents, the German Shepherd Husky mix has a double coat. This coat has two layers; an undercoat made up of short hair and a tougher top coat (10). The undercoat acts as an insulating layer. This keeps them nice and warm in cold regions. However, during summer months some of their undercoat will shed helping them to coat with the hotter weather. All of this makes German Shepherd Husky mixes super fluffy and contributes to their striking appearance meaning their coat is as beautiful as it is useful. Although this is very cute, it also means that you will have to groom your pet more often. If you own a German Shepherd Husky mix, remember that they should be brushed several times a week (11). In addition to this, you should take them to a professional groomer every couple of months. If you have kids one of the crucial questions you should ask if you want to adopt a dog is whether the breed is family friendly. German Shepherd Husky mixes can fit that bill. Although it might sound like a cliche, they will undoubtedly become a member of your family (12). As long as they are socialized from a young age, they will be your children’s best friend. Anyone who has met a German Shepherd Husky mix can see how loyal and devoted they are to their family. They love spending time with the whole family and can be very affectionate. Not only are they cute and cuddly, they make great guard dogs too (13). Yet again, this combination is a result of their heritage, as Huskies are incredibly friendly while German Shepherds are a bit more wary towards strangers. Don’t worry about aggression, however. As long as you socialize them from a young age, they will be your children’s best friend. Like their German Shepherd ancestors, German Shepherd Husky mixes can be especially protective of your children especially if they grew up together. Lovable and protective, what more do you need in a best friend? You should definitely keep German Shepherd Husky mixes in mind the next time you consider adopting a new pet. They represent some of the best traits of their parents breeds making them intelligent, devoted and tons of fun to be around. What do you think about these amazing facts? I know the more I learn about German Shepherd Husky mixes, the more I love them! Tell us what you think about this unique breed in the comments. Don’t forget to share and show your friends just how cool they are! Why Is The Miniature German Shepherd So Popular? Is The Corgi Husky Mix The Puppy For You?